Over the last decade the internet has undeniably made a huge impact on the world. The introduction of e-commerce was definitely one of the main factors. Though Okinawan websites in English are truly few and far between, a few great ones have come online in the past few years. Most of these websites give information about living on and enjoying Okinawa, teach us about the culture and history, or serve us in other ways. Though e-commerce websites abound in the Japanese language, few shopping websites have been made for the English speaking community living on Okinawa. This is beginning to change. There has been a recent boost of e-commerce on Okinawa. Two relatively new websites have finally begun to bring Okinawan e-commerce to the English speaking community and will hopefully serve as forerunners for future local English-language websites. 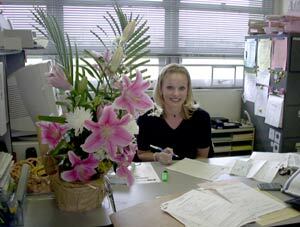 FlowerDrop.net was created by Earlene Sherman late last July to serve the local English speaking community by enabling visitors to purchase flowers online and have them delivered to friends and loved ones living on Okinawa. Her business as a whole is quaint and modest in size like a neighborhood flower shop. However, though small in size, her business has received orders from customers all over the world. The main idea of FlowerDrop.net is that anyone anywhere in the world can go to the website and order a bouquet for a loved one on Okinawa. This is especially useful for family members living in the states who want to send a gift to a son or daughter living on Okinawa and for military members who have had to leave their family while going on a deployment. "We understand busy schedules, TAD/TDYs, deployments, or being long distance," says Earlene. "Our goal is to help you concentrate on your priorities by making it as easy as possible to order beautiful flowers and have them delivered to your loved ones no matter where you are." One of the beauties of FlowerDrop.net is that it allows customers to make as simple or complex of orders as they want. 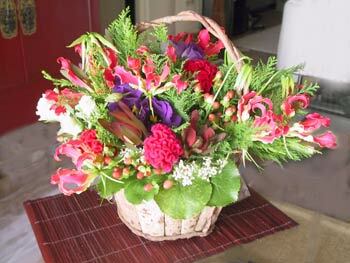 The website is divided into two main categories: single species and mixed bouquets. Here, a user can visit the site and decide whether to order a bouquet of one single type of flower (i.e. roses) or a bouquet of mixed flowers. Seasonal specials are also often added to the website. The mixed bouquet area has several types listed, but visitors are given great flexibility in what they want to order. For instance, if you don't know much about flowers but do know what colors your friend or loved one is fond of, you can order a "pick your colors" bouquet and let FlowerDrop do the rest. If you really don't want to put much work into your order, let FlowerDrop do all of the work for you by choosing "FlowerDrop Select" in the mixed bouquet area. Here, all you have to do is pick the size of the bouquet and the container you'd like it to come in. After that, sit back and let FlowerDrop take care of it. Another great thing about FlowerDrop is that each item has a personalized touch. For instance, once an order is placed and Earlene has finished making the bouquet, she takes a picture and sends it to the customer so he or she can see what has been delivered. Also, each bouquet is unique in design and has other creative touches. Finally, though FlowerDrop.net has a great selection of flowers and bouquets available, visitors are able to make custom orders. If you don't see what you're looking for on FlowerDrop, you can make a custom order by sending an email to Earlene at info@flowerdrop.net. FlowerDrop.net is truly an exciting new website for those with loved ones on Okinawa. No matter if you are currently on Okinawa or abroad, sending a bouquet of beautiful flowers to a loved one is just a few clicks away. Check out FlowerDrop at www.flowerdrop.net.